Want to jazz up your tableware before Diwali? 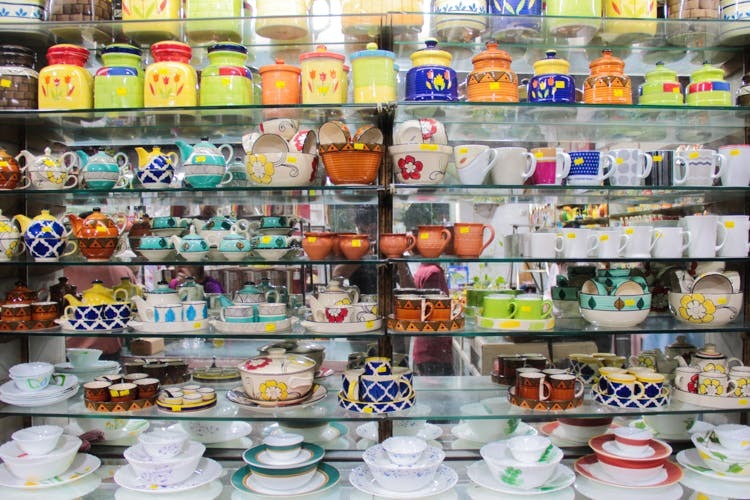 Head to Rajaniklal, an iconic Kolkata crockery store on Park Street. This shop may be your new best friend thanks to its massive selection of crockery and cookware. Chefs, restaurant insiders (and us ordinary people who love the good things of life) have known about this kitchenware specialty shop since its inception. Their range of very ceramic, oven-proof kitchenware with signature designs in blue and white, greens, and oranges have been bought by Kolkata families over generations. Unfortunately, the store on Park Street does not stock this special line any more. Still, it stocks a pretty huge variety of designs. And they make for great gifts too! Their casseroles (INR 150 onwards) will look lovely on any table. The sombrero-style soup plates with wide brims come for just INR 150. You’ll be itching to use the small plates and coasters for your next dinner party (INR 20 to INR 50). The glass jars are perfect for stocking all your cereals, dals, pastas, and cookies. Got green thumbs? They've even got a whole range of ceramic planters. Feel free to lose yourself in the floor to ceiling stacks, but if at any point you’re having a hard time deciding between brands, just ask the staff—they’re always willing to share their knowledge. And look out for the big glass containers with spigots - perfect for fruit-infused water and ice-cold punches. These are not available all the time though. If you don't see them, ask when the next consignment is coming in.